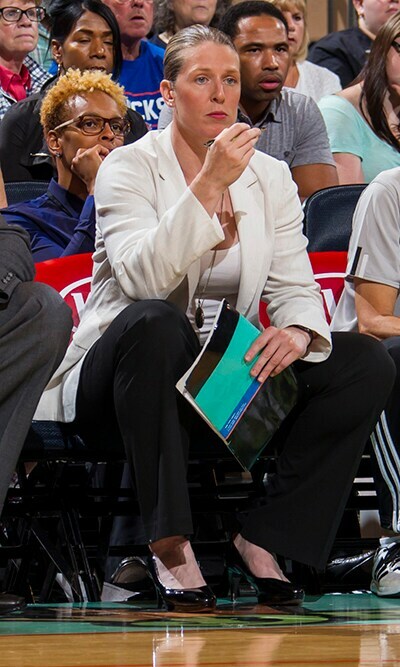 Katie Smith enters her sixth season as a member of the New York Liberty coaching staff, but second as the team’s head coach, after having been named the 7th head coach in franchise history in October 2017. She served the 2015-16 seasons as associate head coach, was an assistant coach with the Liberty from 2014-15. Since Smith joined the coaching staff, the Liberty has posted an overall record of 81-55 (.596), posting 3-straight 20-win seasons and WNBA Playoffs berths from 2015-17. Smith spent the 2013 season – her final in the WNBA – with the Liberty, reuniting with Bill Laimbeer who she won two titles with as a member of the Detroit Shock (now Dallas). She retired after the 2013 campaign, finishing her 17-year playing career as the all-time leading scorer in women’s professional basketball and second in WNBA history, scoring 7,885-career points as a professional and 6,452 in the WNBA. A 15-year veteran of the WNBA, Smith was a seven-time All-Star and two-time First Team All-WNBA selection. She won WNBA Championships in 2006 and 2008 with the Shock, and in 2011 was voted one of the Top 15 Players in WNBA history. She ranks first in the WNBA in both three-point field goals made (906) and attempted (2,466), second in career points (6,452), fourth in free throws made (1,440) and 10th in all-time assists (1,258). Smith is the all-time leading scorer in the history of U.S. women’s professional basketball (ABL & WNBA) with 7,885 career points. Smith signed with the WNBA in 1999, joining Minnesota after a two-year stint in the ABL. In 2006, she became the only player to win a championship with both the ABL and WNBA, which was the same year she became the first player to win a WNBA All-Star game as a member of both the Eastern and Western Conference teams. During the WNBA’s 20th season in 2016, Smith was voted as one of the top-20 best and most influential players in league history. Her success also extended to the international level, having won three Olympic Gold Medals in 2000, 2004 and 2008, and the World Championships in 1998 and 2002. Smith spent several seasons on the women’s basketball staff at her alma mater Ohio State University. As a student-athlete for the Buckeyes, Smith helped guide her team to the NCAA championship game as a freshman, and went on to break the Big Ten scoring record for points scored in a career in men’s or women’s basketball. On Jan. 21, 2001, Ohio State honored her as the first female Buckeye athlete to have her number retired.